Please pardon the corny title, I couldn't resist. I spent Monday morning and evening quilting the doll quilt - something I had procrastinated for a while. Though I call myself a quilter, this is only the third project I have actually quilted myself. It's intimidating to work so hard on something and then attempt to sew all over it - positioning the layers, choosing the right thread, and attempting to be methodical about it - even though the urge is great to just rush right along. This picture is of the back of the quilt - I followed the lead of Red Pepper Quilts in this post - and I have to say it was a fun method. I organized the New England Modern Quilt Guild doll quilt swap and in the guidelines, I told people a certain size to not exceed.... But mine is kind of huge. Can someone please tell me it's okay that this thing measures 21" x 28"??!!! While I was at it, I went ahead and made Gregory a tie-onesie as well. As I went through my stash to make these, I realized I have maybe 4 stripes to choose from. I guess I usually gravitate towards polka dots and other geometric prints. A good friend asked me to give her sewing lessons.... I get asked for this fairly frequently, but usually people really aren't very serious about it. But this person is determined and we had our first "lesson" on Tuesday. I was really impressed with how she dove right in - she was careful and methodical but not overly perfectionistic. She also was very eager to learn and not scared to do things by herself. I turned to one of my favorite books, Bend the Rules Sewing by Amy Karol, to do our first project. In hindsight, it might have been better to do the "clutch" pictured on the cover of the book, but the "mini tote" was fine too. I only say this because the clutch is EXTREMELY simple and we could've finished it in 1 hour easily. One handle is shorter than the other - which is a feature I thought I might omit - but I decided to go for it and I really like how it turned out. This project is so easy - only took me 1.5 hours and requires only 2 fat quarters. I love the outer print I used - a Kokka import that has little bikes and trees on it. I got these fabrics at Marden's a while ago with her in mind and then forgot about them. I like them, but there is no pink, no birds, apples, trees, gnomes (I am kidding about the gnomes)..... This experience has got me thinking: I have a lot of fabric that is uniquely my taste - it may not necessarily match what other people prefer. I would say that 75% of my sewing is done for other people..... Kind of funny that I have a bit of a loud, wacky fabric selection - but those around me are a bit more subdued in their preferences. Now I would like to declare publicly that I am on a fabric diet. Nick is on the job hunt and I need to actually sew with the fabric that I own. So I am hoping by making it to known to the universe out there that I am not buying fabric right now!!!! So far, I have stuck to it - but I am not going to deny that I have been tempted many times to cheat. Second, I receive the Hawthorne Threads newsletter through email every Monday. I was really thrilled when I saw a few prints from Urban Zoologie. I am not crazy for the owls at all, but it's the whale prints that keep me up at night! I absolutely have been obsessed with whales since a very young age. In third grade I wrote a very wild and imaginative story called "Annie and the Whale" - I still have it in my scrapbook right now. I consider the day Nick and I went on a whale watch out of Gloucester to be the fourth best day of my life (1st: wedding, 2nd: birth of Gregory, 3rd: playing with baby lion cubs at a farm in South Africa - in case you were wondering). To this day, I often have dreams about swimming with whales - and to be honest - it kind of freaks me out a little. Anyway, if you are still reading this blog post, hopefully you are not thinking about that horrible book (the first and last book I will read by Wally Lamb) - I do not identify with whales like that protagonist did! Moving on, I am also really excited about Moda Bliss. 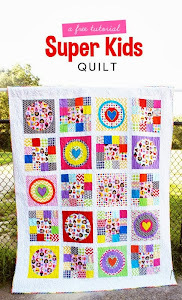 The best way to get a view of what this collection is like is to see this quilt top over at Comfort Stitching. I am not crazy about all of the prints, but I think the style and color palette would make a timeless Grandmother's Flower Garden quilt. For all the Meadowsweet fans out there, you might be excited to know that Meadowsweet II is coming in July/August. I love the colors even better than the first version. Finally, I think that the upcoming Dr. Seuss fabric is adorable. Apparently such fabric has been released before and is now going for a billion dollars on EBay. There are a few fabric lines that just came out that I have been eyeing: Tufted Tweets, Castle Peeps, and Far Far Away II. A lot of online vendors sold out of these collections before they could even get the plastic wrap off of the bolts. I think that sewing for children is so much fun! Okay, when I go to garage sales - I cannot resist buying vintage buttons, thread, or florally vintage fabric. This lady had a huge box of vintage patterns too, but I restrined myself and bought only 2. I know I do not have a daughter, but I could not resist the illustrations on these pattern envelopes. I am embarrassed with how many vintage buttons I have... if you ever need any buttons - you know how to contact me! This is the conversation I had with my husband when he saw the finished project. "Now you can be like your idol." Here's a sneak peek at the doll quilt I finally started... I am following the blog-craze of paper piecing hexagons. It is as fun and addicting as everyone says it is. As I write this, I am about to put the whole quilt top together - I finished the hand piecing last night. I was so into it towards the finishing stretch, that I accidently sewed my project onto the jeans I was wearing! Thankfully it wasn't too hard to undo. This is a very untraditional color scheme for me, but the reasoning will be explained soon. I am REALLY excited about it! After the fun, busy-ness of the past 2 weeks, I was looking forward to getting back to doing some sewing for myself. Even though I really should've been working on the Doll Quilt Swap, the haggard off-white and light blue pillowcases on my bed were not complementing this gorgeous quilt very well..... At the last NEMQG meeting, I picked up some of the infamous Kona cotton solids at Fabric Corner. The modern quilting world is nuts for this stuff- and I think I can see why. 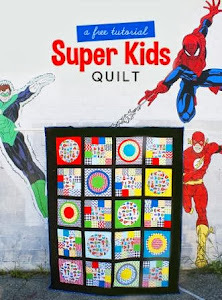 It is affordable (@ $4 a yd online or on sale), each color is rich and deep, it has a nice texture, and it really helps showcase and often tone down the crazy fabrics us modern quilters often gravitate to. So I figured last night, it wouldn't be too much to try and start making one of these at about 9 pm.... I didn't get into bed until midnight! What is wrong with me? I don't understand how I can make something like this, yet a simple pillowcase proved difficult and made me have to sit down with the seam ripper for quite a while! I even watched this You-Tube tutorial a few times till I finally got it right. If anyone can tell me why there seems to be a "glowing" spot in this photo - I am all ears. I tried to edit it in photoshop - but obviously that didn't work. As of this writing, I have completed one other pillowcase, 2 more to go. I plan to finish them today. Last Wednesday I just had that feeling that I needed to sew. There was no escaping it. I had lots of other things to do and was quite excited that my sister in law was flying in that afternoon- but I just HAD to sew something. I went ahead and made some bibs, using the tutorial from the Sew She Sews blog. Here's my baby modeling the one he gets to wear. I also made another one for a very kind person I met on flickr. She found out I was looking for a particular fabric and bought it for me at her local quilt shop. I reimbursed her, of course, but I was so happy with her generosity and kindness- I wanted to make her something. She was 9 mos + pregnant, and just had a little boy- so she gets the one with the orange elephants. I don't think she reads this blog, so she will have a nice surprise at the mailbox quite soon! The fabrics used include Teeny Tiny Zoo by Alexander Henry in chocolate, Attitude Girls dots in green, Amy Butler tangerine full moon dots, and the elephant prints are a Japanese fabric. I have had a great time with all the family visiting these past few weeks. I was pretty excited that Melissa was able to attend a meeting of the NEMQG. We had a great time at the Arlington library with a show and tell and class on curved piecing and hexagons. I definitely learned a lot! It wasn't hard at all and I really liked the result. The teacher of our class, Shelly, (also our NEMQG treasurer) was SO nice and patient with all of us and I was so impressed with her ability to run such a great class. The first time I met her was at our first meeting when she brought milk and cookies to share with everyone. Talk about welcoming! I love the colors and freshness/fall look of it. I used the orange flower one twice because it was needed to help tie in the fabric that was the side/base and handles. I can honestly say that I am TIRED of this pattern and you won't be seeing it again for a while.